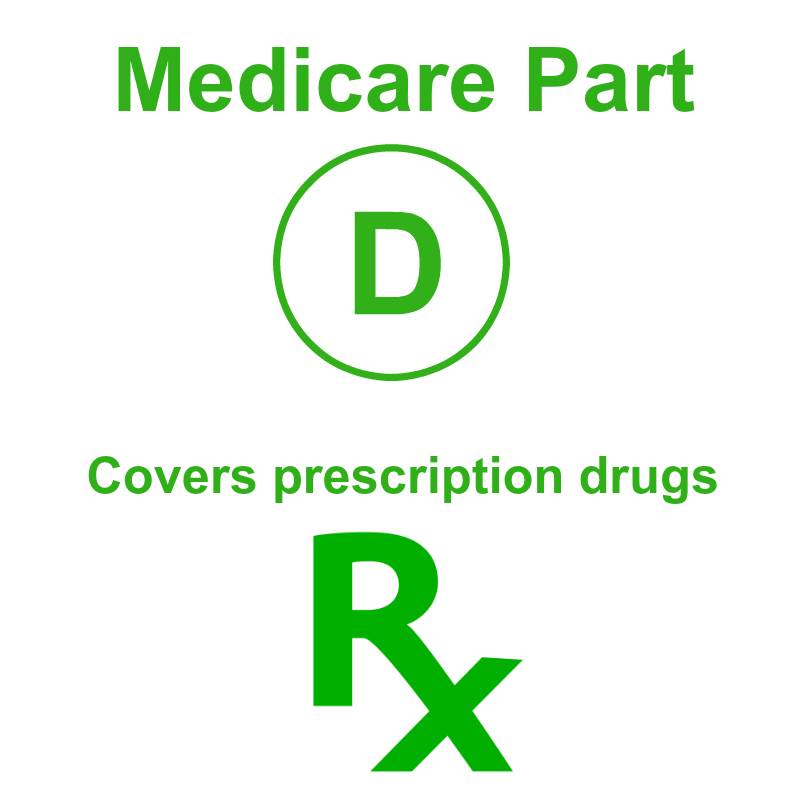 Medicare Part D covers outpatient prescription drugs. Do I have to enroll into a Part D plan? Enrollment is voluntary. If you have drug coverage that meets the Medicare Part D creditable coverage standard of equal to or better than a standard Part D plan, you do not need a Part D plan. However, if you do not have creditable drug coverage, you will be charged a late enrollment penalty if you decide to enroll into a Part D plan at a later time. The late enrollment penalty is 1% of the national base Part D premium times the number of full, uncovered months you didn’t have Part D or creditable coverage. In 2019, the national base premium is $33.19. The Part D penalty is in effect for life. Example: Martin turned 65 in June 2015 and did not enroll into a Part D plan before his initial enrollment period (IEP) ended on September 30, 2015. Martin enrolled into a Part D plan with coverage effective January 1, 2017. Martin did not have drug coverage for 15 months after his IEP ended. His Part D late enrollment penalty is $5.02//month (15% of $33.50). Yes, there are two types of Medicare Part D drug plans. You must have Medicare Part A OR Part B to enroll into a PDP. These plans provide Medicare Part D benefits only. You get your Part A and Part B benefits through Original Medicare. 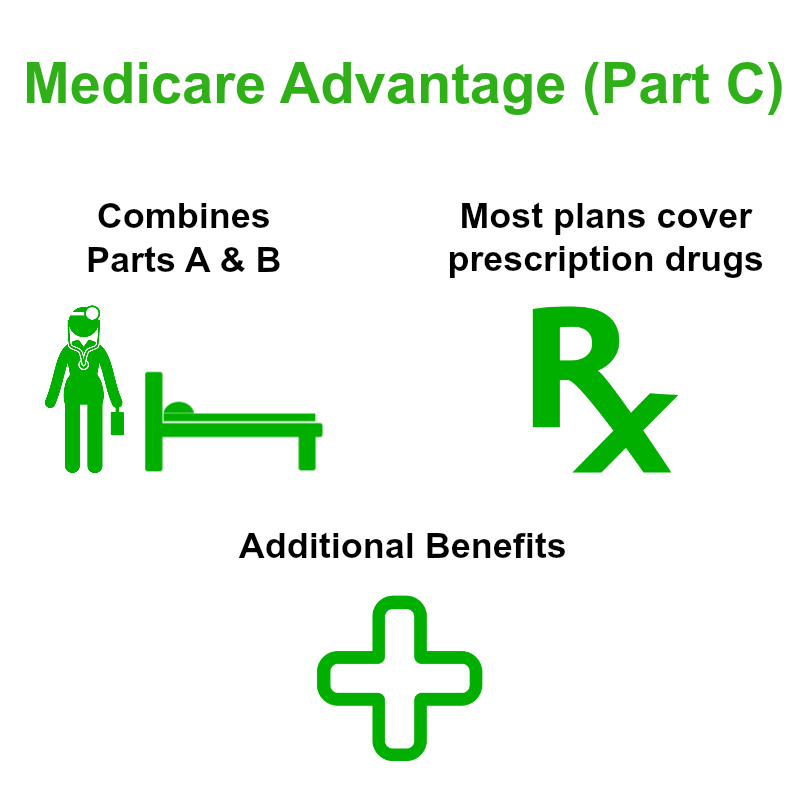 Medicare Advantage drug plans are managed care plans that include Medicare HMOs, PPOs and SNP plans. These plans manage your Medicare A, B and D benefits. To enroll into a MAPD plan, you must have BOTH Medicare Part A AND Part B. Persons who enroll into a MAPD HMO or SNP plan must use plan network providers to obtain their Medicare A, B and D services. Persons in MAPD PPO plans are permitted to receive services from non-network providers, but will pay higher copayments. When can I enroll in a Medicare Part D plan or switch to another plan? A seven month period that occurs when you first become eligible for Medicare. It starts 3 months before the month of eligibility and ends 3 months later. Example: February is the start date of your Medicare eligibility. Your initial enrollment period starts November 1st and ends May 31st. During October 15 - December 7 of each year, you can change your Medicare health or Part D Prescription Drug Plan coverage. These changes are effective January 1 of the following year. For a complete list of Part D special enrollment periods, see Enrollment Periods. I have prescription drug coverage through a former employer. Do I need a Medicare drug plan? If your drug coverage is considered “creditable drug coverage,” meaning it is as good as the standard Medicare drug benefit, you do not need a Medicare drug plan. If you are not sure, call your former employer or your insurance company. If you lose creditable drug coverage through a former employer, you will have a special enrollment period of 63 days to enroll into a Medicare drug plan and you will not be charged a late enrollment penalty. I have Medicare and Medi-Cal. Do I have to enroll in a Medicare drug plan? How much will it cost? Persons who have Medicare and full Medi-Cal are required to have a Medicare Part D drug plan. 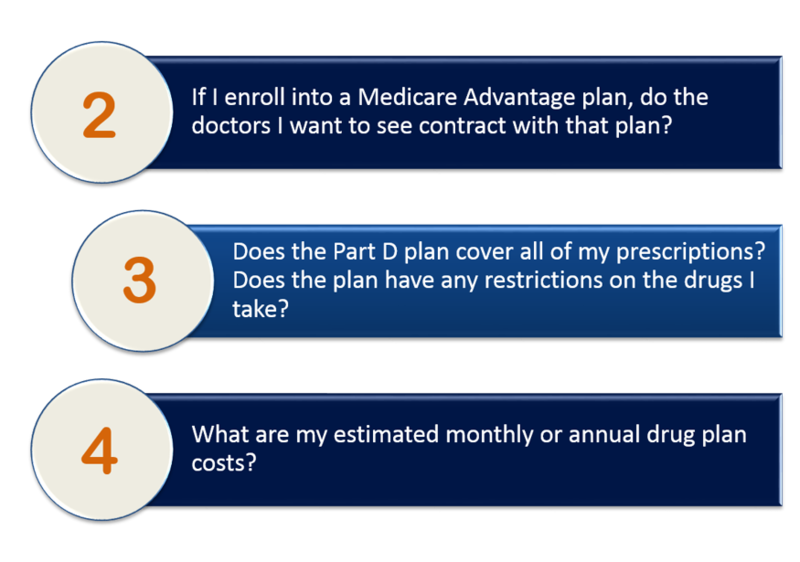 If you do not voluntarily enroll into a Part D plan, Medicare will assign you to a Medicare Part D PDP plan. If you enroll into a subsidized PDP plan (also called a benchmark plan) you will pay no monthly premium. For a list of California benchmark PDP plans, click 2019 Benchmarks. If you enroll in a non-benchmark PDP plan, you will be responsible for paying a portion of the plan's monthly premium. Medicare Part D plans do not cover all prescription drugs. Each Part D plan has its own list of covered drugs or formulary. Use the Medicare Part D drug plan search tool on the Medicare.gov website to choose a Part D plan. If you need help, contact the Center for Health Care Rights. Learn more about how Medicare and Medi-Cal work together. Are all the Medicare drug plans the same? Formularies. 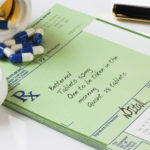 A formulary is a list of prescription drugs that the plan covers. Premiums and co-payment costs. Each plan determines how much they will charge for covered drugs. To compare California Medicare drug plans, use the Medicare Part D drug search tool at Medicare.gov. Are Part D plans permitted to restrict access to prescriptions covered by the plan? Your physician must obtain the Part D plan's approval for the prescription before the plan will pay for it. Medicare Part D plans may limit the number (or amount) of drugs covered within a certain time period. You are required to try a less expensive drug on the Part D formulary that has been proven effective for most people with your medical condition before you can move up a "step" to a more expensive drug. What prescription drugs are not covered by Medicare Part D plans? The following prescription drugs are excluded under the Medicare Part D Program. This means that they cannot be covered by any Part D plan. Drugs that may be covered under Medicare Part A or Part B such as nebulizer solutions, oral chemotherapy drugs, and immunosuppressive drugs. Premiums: Premiums range from $0 to $169.80 per month. Deductible: The annual deductible is $0 to $415. 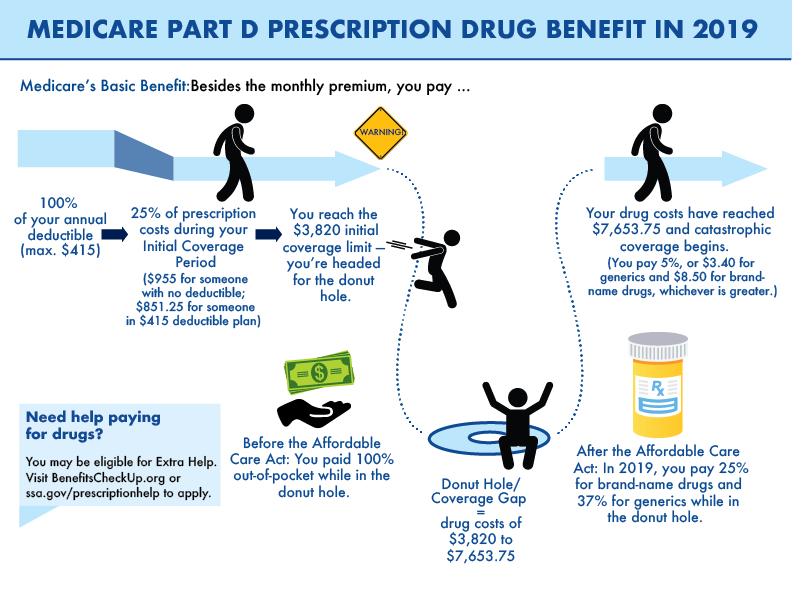 The deductible is the amount you pay before your drug plan pays your prescription drug costs. Cost of Non-Formulary Prescriptions: You are responsible for full cost of prescriptions that are not covered by your Part D plan’s formulary. To obtain coverage of a non-formulary drug, you and your doctor must file a part D exception request. For more information see the question"What rights do I have if my Part D plan denies coverage of a drug I need?" below. 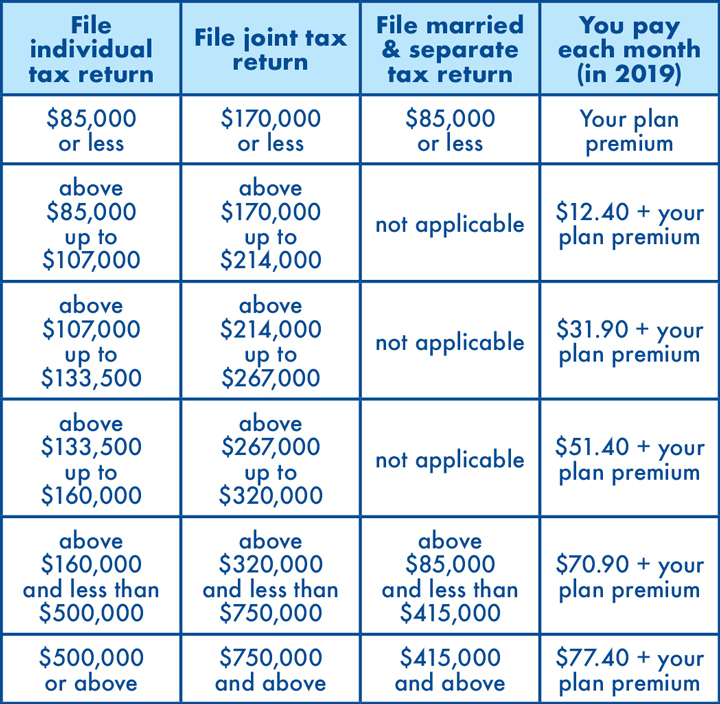 Part D Income Related Premium Adjustments: If your income is greater than $85,000/year for a single person or $170,000/year for a married couple, you will pay a Part D income related monthly adjustment (IRMAA) that is based on the income reported on your IRS tax return from two years prior. You will pay the Part D IRMAA in addition to your monthly Part D premium. The chart below lists the extra amount costs by income. What can I do if I need a drug that is not on my Part D plan's formulary? You and your doctor have the right to file an exception request. The exception request must explain: 1) why is the non-formulary drug medically necessary, and 2) why a drug covered by the plan formulary is not appropriate (e.g., it will not be as effective or would have an adverse effect). The drug plan is responsible for reviewing your exception request. 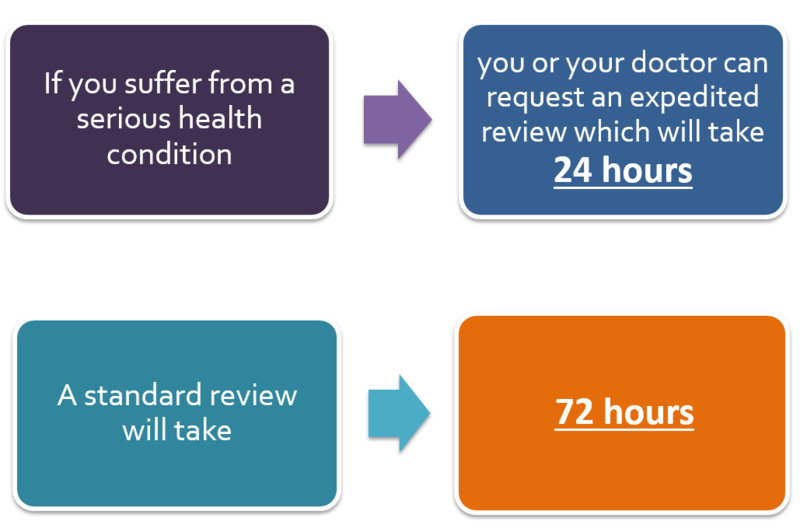 Criteria for expedited review: waiting for a standard decision may seriously jeopardize your health. What rights do I have if my Part D plan denies coverage of a drug I need? If your Part D plan denies a prior authorization or exception request, you have the right to appeal. Level 1 – Redetermination: The first level of the appeal process is called the redetermination. 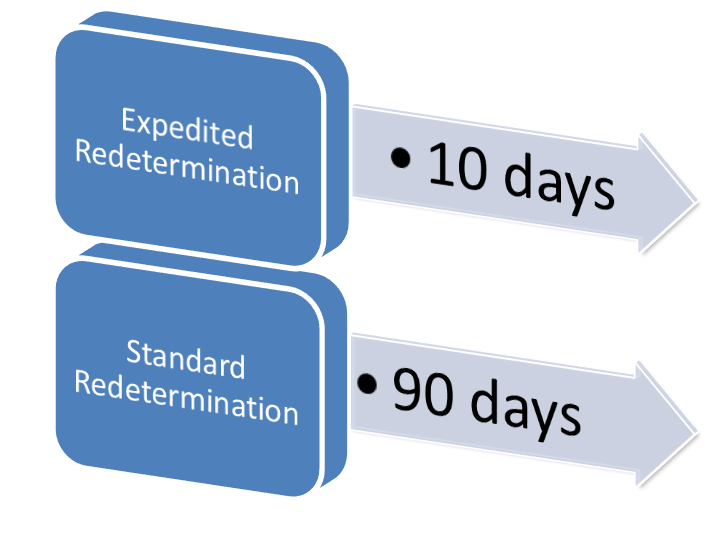 You must file your redetermination request within 60 days of receiving your exception request decision. Your plan is responsible for reviewing the redetermination request. 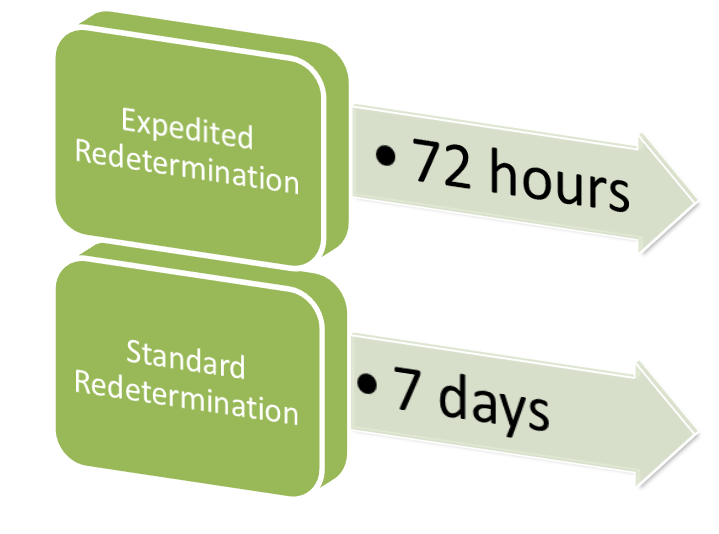 The timeframe for an expedited and standard redetermination is shown below. Level 2 – Reconsideration: If you redetermination request is denied, you can appeal by requesting reconsideration. You must file your reconsideration request within 60 days of receiving your redetermination decision. The reconsideration request is reviewed by an independent medical review entity, Maximus. Level 3 – Administrative Law Judge Hearing: If your reconsideration is denied, you may appeal by requesting a hearing before an administrative law judge. You must request the hearing within 60 days of receiving the reconsideration decision. In 2019, to request an administrative law judge hearing there must be at least $160 at issue. For more information on administrative law judge hearings, click Office of Medicare Hearings and Appeals. Level 4 – Medicare Appeals Council Review: If the administrative law judge decision is unfavorable, you have 60 days to submit an appeal to the Medicare Appeals Council. For more information on the Medicare Appeals Council, see Office of Medicare Hearings and Appeals. Level 5 – Federal District Court: The final level of the appeals process is filing an appeal in federal district court. You must file your appeal within 60 days of receiving the Medicare Appeals Council decision. In 2018, to file an appeal in federal district court, there must be at least $1,600 at stake. You will need an attorney to file this level of appeal. The Part D appeals process applies to both PDPs and MA-PDs. I don’t have Medi-Cal. Can I get financial assistance with my Part D expenses? Yes, the Low income Subsidy (LIS) or Extra Help Program will help pay your Part D costs if you qualify. There are two levels of assistance under the LIS Program; Full LIS Extra Help and Partial LIS Extra Help. To qualify for the LIS Program, you must file an application with the Social Security Administration. You can apply for the program at any time. *In-kind support is not counted toward the income limit. **Asset limits include $1,500 per person for burial expenses. The home you live in, your cars, and life insurance policies are not counted as assets. When your total Part D drug plan costs are greater than $5,100, Medicare pays 100% of covered costs. *These asset limits include $1,500 per person for burial expenses. What is counted toward the LIS income limit? Earnings from your job. However, not all of your earned income will be counted. If you have full Medi-Cal benefits, you do not need to apply for LIS. You automatically qualify for LIS and pay $1.25 to $3.80 for your medications. You can apply for LIS at your local Social Security office, or online at Extra Help Application. For more information about Extra Help, call the Center for Health Care Rights at 800-824-0780. What should I consider before selecting a Part D Drug Plan?